INTRODUCTORY The great purpose towards which all the dispensational dealings of God are tending, is revealed to us in the fifteenth chapter of the First Epistle of Paul to the Corinthians: "That God may be all in all." With this agrees the teaching of our Lord in John xvii. 3: "And this is (the object of) life eternal, that they might know Thee the only true God, and Jesus Christ, whom Thou hast sent." This being so, shall we not act wisely by keeping this object ever in view in our daily life and study of God's holy Word? All Scripture is given by inspiration of God and is profitable, and hence no part is, or can be, neglected without loss. Few portions of the Word will help the devout student more in the pursuit of this all-important "knowledge of God" than the too-much neglected "Song of Solomon." Like other portions of the Word of God, this book has its difficulties. But so have all the works of God. Is not the fact that they surpass our unaided powers of comprehension and research a "sign-manual" of divinity? Can feeble man expect to grasp divine power, or to understand and interpret the works or the providences of the All-wise? And if not, is it surprising that His Word also needs superhuman wisdom for its interpretation? Thanks be to God, the illumination of the Holy Ghost is promised to all who seek for it: what more can we desire? Read without the key, this book is specially unintelligible, but that key is easily found in the express teachings of the New Testament. The Incarnate Word is the true key to the written Word; but even before the incarnation, the devout student of the Old Testament would find much help to the understanding of the sacred mysteries of this book in the prophetic writings; for there Israel was taught that her Maker was her Husband. John the Baptist, the last of the prophets, recognized the Bridegroom in the person of Christ, and said, "He that hath the bride is the Bridegroom: but the friend of the Bridegroom, which standeth and heareth Him, rejoiceth greatly because of the Bridegroom's voice: this my joy therefore is fulfilled." 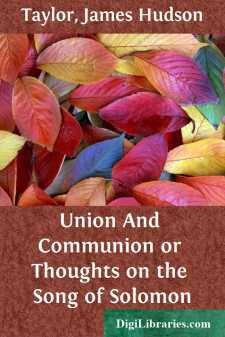 Paul, in the fifth chapter of the Epistle to the Ephesians, goes still further, and teaches that the union of Christ with His Church, and her subjection to Him, underlies the very relationship of marriage, and affords the pattern for every godly union.